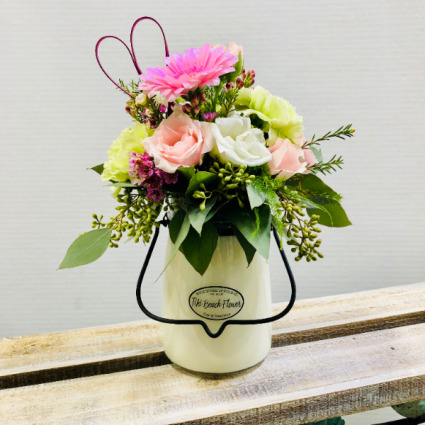 A Milkhouse (22 oz) candle is adorned with a bouquet of spring flowers and a metal heart tucked on top. 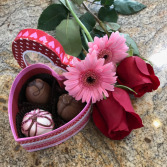 Add a tropical touch to say "I love you". 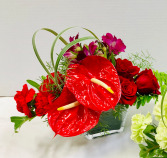 Two tropical red anthuriums are center stage backed with roses, carnations, altros and some tropical greens with a twist of bear grass. There is a green version also available. Select from an assortment of Valentine's kebab. 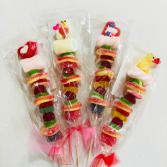 The kebab has 7.25 inches filled with fruit favored gummy candy and top off with a marshmallow and or candied heart/bear.